The Edwards and Trinity Aquifers provide critical water resources to Central Texas. Streams that create the beautiful Texas Hill Country are in fact hydrologically linked to the aquifer (groundwater) systems. Aquifers provide springflows that sustain the streams, and the streams, in turn, recharge the aquifers. Many studies, going back decades, document the surface and groundwater interactions in the Edwards Aquifer. However, despite the growing demand for water and increasing threats to surface water resource from both ecological and human health perspectives, few studies have been conducted to understand those interactions in the Hill Country Trinity Aquifers of Central Texas. The purpose of this document is to summarize new information from recent studies along the Blanco River (Smith et al., 2015) and Onion Creek (Hunt et al., in press). These studies provide a greater understanding of the surface water and groundwater resources in the area that could help guide policies for groundwater and surface-water management, and also guide future scientific studies. Gaining portions of the streams over the Trinity Aquifers provide for recharge downstream to the losing reaches over the Edwards Aquifer, which provide base flow to Barton and San Marcos Springs. 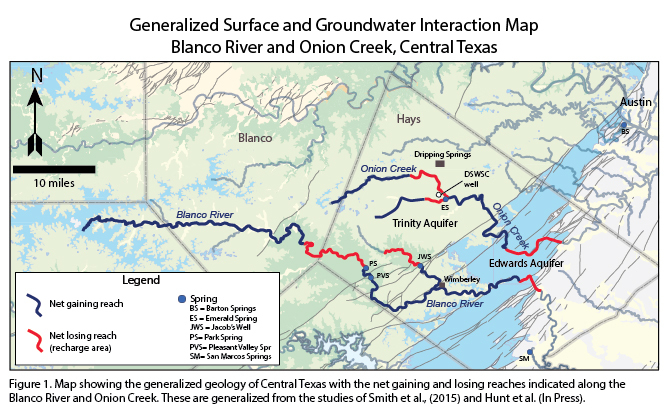 In summary, these studies provide strong evidence that water flowing in the Blanco River and Onion Creek are recharging the Trinity and Edwards Aquifers along certain reaches of the streams. The greatest uncertainty of these studies is how much, how quickly, and under what conditions does recharge occur into the Trinity Aquifer. To address these uncertainties scientists are continuing to collect hydrogeologic data and planning additional studies. Future studies could involve dye tracing to determine the fate of the surface water after it enters the aquifer, additional flow measurements, more extensive water-level measurements, and further geochemical analyses of groundwater and surface water. Hunt., B.B., A.S. Broun, D.A. Wierman, D.A. Johns, and B.A. Smith, In Press, Surface and Groundwater Interaction Along Onion Creek, Central Texas: Gulf Coast Association of Geological Societies Transactions, 66th Annual Convention, September 18-20, 2016, Corpus Christi, Texas. Smith, B.A., B.B. Hunt, A.G. Andrews, J.A. Watson, M.O. Gary, D.A. Wierman, and A.S. Broun, 2015, Hydrologic Influences of the Blanco River on the Trinity and Edwards Aquifers, Central Texas, USA, in Hydrogeological and Environmental Investigations in Karst Systems, (Eds) B. Andreo, F. Carrasco, J. Duran, P. Jimenez, and J. LaMoreaux, Environmental Earth Sciences, Springer Berlin Heidelberg, Volume 1, pp 153-161. This research would not be possible without collaboration with the Hays Trinity Groundwater Conservation District, City of Austin, Edwards Aquifer Authority, local scientists, and land owners.